Landon Donovan says that Swansea City have transfer funds available and are close to strengthening their squad. The 35-year-old former USA captain is a consultant and minor shareholder at the Premier League club. Swansea have had a bid accepted for Hull City's Sam Clucas, who would bolster a midfield left short by Gylfi Sigurdsson's £45m sale to Everton. "There is always money to spend, to some extent, but it's about whether you are getting a good deal," Donovan said. "You can't just spend money to spend money. We are not Manchester United or Chelsea or Tottenham that have an endless supply of money. "It takes the right deal at the right time, but we are not afraid to spend money. "In the end I think for Gylfi it was a good thing to do but now the team has to move forward. It's exciting for Huw [Swansea chairman Jenkins] now to have some money to work with and money to spend. We need to keep making the squad better. "From minute one they [Swansea's majority shareholders, Americans Steve Kaplan and Jason Levien] said, 'we are going to make the team better'. "We're not going to spend money just to spend money, but if there are a few signings that make a lot of sense then we have the ability to do so." While Swansea continue their pursuit of the 26-year-old Clucas, the Welsh side have seen their advances for former player Joe Allen rebuffed by Stoke City. But Spanish midfielder Roque Mesa has arrived from Las Palmas for £11m, plus Dutch goalkeeper Erwin Mulder and striker Tammy Abraham on loan from Chelsea. 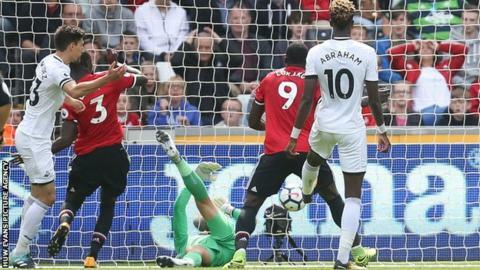 However, Swansea have failed to score in their opening two Premier League games, a 0-0 draw at Southampton and then a 4-0 home defeat to Manchester United. "You may potentially see one or two signings... in the next couple of weeks, but it has to be the right player," Donovan added. "We can't afford to make big mistakes. If Manchester United miss on a £40m transfer, it's not a big deal. If we do, it could be the end of the club, or the end of the club in the Premier League. You have to think about it smartly."